A worker received £7000 for a broken ankle at work claim following an accident at work when it was found that the correct safety procedures had not been followed. What happened to cause the broken ankle claim? The worker decided to pursue a broken ankle at work claim after being forced to take two months off work because of the injuries he sustained. His work as a retained fireman also suffered as he had to take three months away from his duties. Because a machine was being relocated the site should have had protective safety barriers erected around it and hazard signs warning of the work taking place. As this was not done an exposed hole in the ground appeared where the machine stood and unfortunately the worker fell into it and sustained a fracture of his ankle. Accidents at work causing a broken ankle – How common are they? 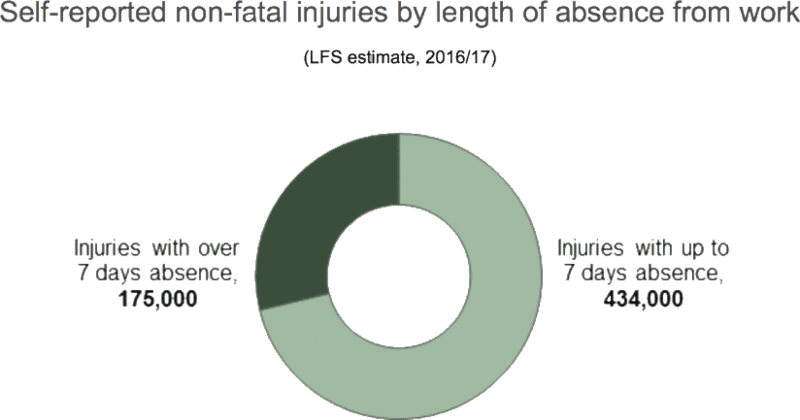 According to the 2016/17 statistics provided by the Labour Force Survey for the Health and Safety Executive there have been 609,000 self-reported injuries of all kinds sustained at work in Britain. Of these many will have been injuries to lower limbs and specifically to the ankle. Ankle fractures are the most commonly treated fractures in hospitals because it is so easy to injure the ankle by, for instance, twisting or rotating the ankle, falling or tripping, or jumping and landing awkwardly. Any injury received in the workplace can result in accident at work claims. In any industrial accident claim, there are a number of components that will make up your claim. In the case of the worker who broke his ankle falling down a hole there would have been a considerable loss of earnings from not one but two forms of employment and luckily his team were able to help him with an accident at work claim. His pain and suffering would incur compensation payment as would any future complications with mobility or disfigurement that could have occurred. Because he would not have been able to drive whilst recovering from his injury he was also able to claim for travel expenses which he was forced to incur. So if you ask the question what’s a broken ankle worth the answer may surprise you. You can get some idea of what you could expect from our accident at work claims calculator or speak to one of our knowledgeable team of experts. What’s the Difference Between Broken Tibia and Fibula Compensation? Although a broken bone of any kind in the leg is undoubtedly painful and can be traumatic for many reasons, there are subtle differences between how much broken tibia and fibula compensation you can get when it comes to a broken ankle at work claim. For example a leg injury claim could win you between £1800 for a very mild injury with no long term difficulties to £215,000 for a very serious injury that results in amputation. The bones in your lower leg comprise the tibia and fibula. A fracture of the fibula is not as serious as a fracture of the tibia because, as the smallest lower leg bone it is not necessary for weight-bearing although a fracture here can be painful and initially debilitating. For some idea of what to expect in a broken tibia and fibula compensation claim take a look at our claims compensation table in our leg injury guide. Claiming Against Your Employer for a Broken Ankle at Work – What’s Involved? The good news is that pursuing a broken ankle at work claim for an injury sustained at your workplace is relatively straightforward when you use the services of a good solicitor who has specialised knowledge of accident at work claims. Our team of experts have years of experience in dealing with personal injury claims of all types so while you deal with the business of recovering from your injuries we will be busy gathering evidence, liaising with other parties, compiling any medical reports and dealing with all the paperwork involved. Please don’t worry that your employer may discriminate against you if you bring a compensation claim against them. All employers have a legal duty of care towards their employees and must abide by all relevant health and safety legislation in order to ensure the safety, health and wellbeing of employees. This duty of care is defined under the Management of Health and Safety at Work Regulations 1992. It is illegal under Employment Law, specifically the Employment Rights Act 1996, to dismiss a worker for bringing a compensation claim and it is illegal for your employer to treat you differently from other workers because of your claim. The time limit for claiming compensation for an accident at work is 3 years starting from the time the injury occurred or from the time you first became aware that your injury was caused by an incident within the workplace. As a company who specialise in broken ankle at work claims as well as many other injuries we are able to help you with your workers compensation for an ankle injury claim so if you’ve suffered a workplace accident similar to the one we’ve already discussed, like a broken ankle at work claim or any kind of injury, we are here with free advice to help you decide whether to pursue your claim and how to go about it. If you then decide to go ahead our No Win No Fee policy means that you won’t have to pay any upfront costs to pursue your broken ankle at work claim. With the average settlement for a broken ankle anything from £10,000 upwards why wait? For details of ankle injury compensation amounts and advice on how we can help call us on 0800 0733 8804 or use our online chat option to find out more about your potential broken ankle at work claim. If you have suffered a broken ankle, whether you’re likely to pursue a broken ankle at work claim or not, then you may be interested in learning more about your injury. The Health and Safety Executive publishes statistics about injuries that have been reported. This definitive guide to leg injury claims may help you if you are looking to pursue a broken ankle at work claim.